Following the birth of Kim Kardashian and Kanye West's third child via gestational carrier, the world was left to speculate about what the famous couple had named their newest addition. That's because although Kardashian revealed their daughter's birth date and details on her app — "Chicago West, January 15, 2018, 12:47 a.m., 7 lbs, 6 oz." — she glaringly left out the baby's name. It wasn't until a few days later that Kardashian revealed what they had ultimately decided on. Drum roll please ... Chicago West! But why are Kim and Kanye against middle names? Because all three of their children are lacking one. As with their first two children, Kardashian and West opted to forgo a middle name for little Chicago, whom they lovingly refer to as "Chi." (Pronounced like the word, "Shy.") Kimye's first child is named North West and their second child is Saint West — so the name Chi West definitely fits their pattern of sticking with one-syllable first names and shunning middle names entirely. 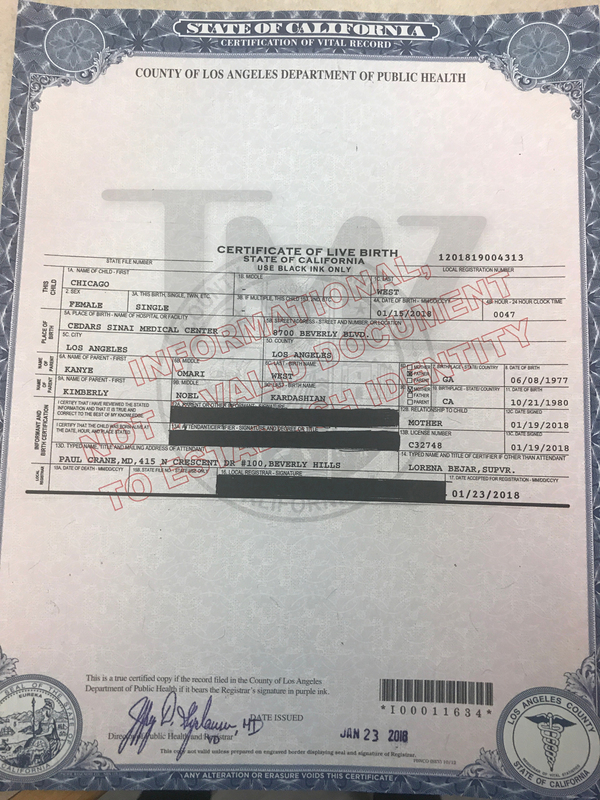 In a copy of the birth certificate obtained by TMZ, it was confirmed that like her two older siblings, baby Chicago does not have a middle name. It's worth noting, too, that both of her parents do sport traditional middle names: Kanye Omari West and Kimberly Noel Kardashian. So what's the deal? As W Magazine reported, Kardashian has never publicly revealed why she and West have skipped middle names for their children. Since both of them have middle names of their own (and so do all of Kardashian's siblings and their children,) it doesn't seem to be any type of family tradition, the publication reported. So the world seems to be just as stumped as her fans. Perhaps this is something Kim K will address in an upcoming episode of KUWTK? In an appearance on The Ellen DeGeneres Show back in November, Kardashian confessed she and Kanye still hadn't decided on a name for their third child. "We're freaking out," she told DeGeneres, reported Us Weekly. "We have no name." The funny host took this as an opportunity to put her baby name generator to good use. DeGeneres suggested the following options: Lip-Kit West, Pop West, West West, and Star West. Kardashian admitted that Star West would definitely have gotten big sister North's vote. "You know what's so funny? I'm not going to name her Star, but my daughter picks that name all the time," Kardashian said, according to the publication. "So, she got a toy and it's a llama — Baby Sister's toy that she took — and I said, 'Well, OK, what do you want to name the llama?' She said, 'Star—Star West!' So, she names everything Star West." Kardashian went on to explain a few stipulations she follows when it comes to naming her children. I do like different names. But short, easy to spell, one syllable. That's kind of my vibe. Chi West decidedly fits the bill. And as far as middle names are concerned, with such an epic first name like "Chicago," what could Kimye possibly follow that up with? (Chicago Sue West? Chicago Marie West? See, it just doesn't work.) So I'm gonna have to agree with baby Chi's parents on this one: Names like Chicago, Saint, and North can definitely stand on their own.